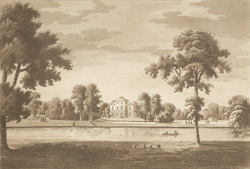 Built in 1757 in an attractive riverside setting, Asgill House was one of the later Georgian mansions to be built in Richmond. It was designed by Sir Richard Taylor in the fashionable Palladian style. The owner of the house, Sir Charles Asgill, was a successful banker and a former Lord Mayor of London. This was one of Taylor's first major house designs, on his way to becoming Architect of the King's Works.